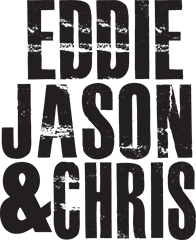 It’s the end of an era as Eddie Jason & Chris say goodbye to the excuse that brought the trio of friends together religiously for the past six years (but much longer if their previous show is counted). EJC close a chapter of their lives by looking back at the live radio program and podcast that melded their minds, for better or worse, each week. Listen to old show clips, the guys pay tribute to their many loyal listeners, give behind the scenes commentary, and honor one another’s commitment and talent that made it all possible. Thank you for the years support. Cheers!